"Let no good idea go unused". 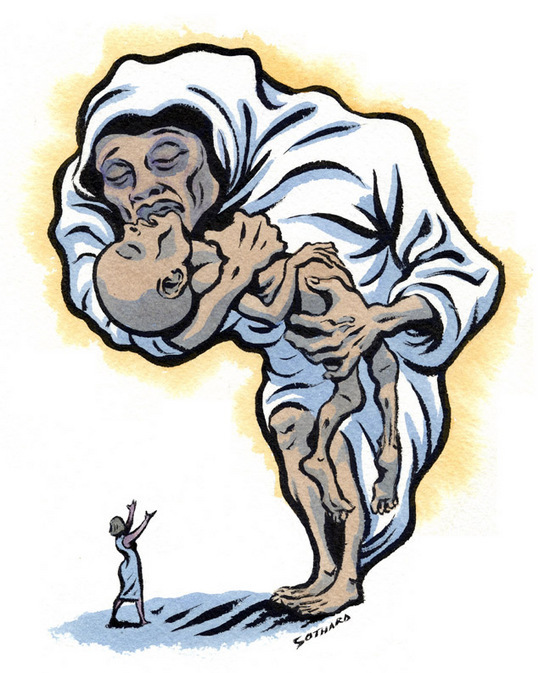 Some time ago, I was asked by Edel at TIME to create an image for the back page, on the current African adoption issue. The article went South, through no fault of ours, but I filed the idea away, since I thought it successful. Today it was recycled to another publication. I still have the concern that the figures are so dramatic that the shape of Africa might be lost. I am not sure I would have seen Africa had you not mentioned it. Maybe if you have less contrast in the figures, no black lines other than the outline? Or the shape of Africa in one flat color with just the lines of the figures? Or just maybe grab a beer and be happy you sold this sucker twice! I like it a lot. I saw africa right away, BTW. Maybe it's a nice bonus to the viewer, if they don't see the Africa shape right off...to discover it a few seconds later. But if it fails the 8 second visual test....it's irrelevant. Hi David, I did recognize the continental outline just by looking at the recent article tile. It's tough to illustrate famine and poverty and not being pitiful. I like the gestures and scale of the two mothers. Great illustration. Beautuful solution, David. Your skillful drawing bring this off in a way that I doubt few others could manage. The continent of Africa is clearly visible. I saw Africa in the thumbnail. Then it was hard to judge the big image after reading the comments. Who am I kidding, I see Africa in that one too! But, wait, what if her feet would not touch the ground? That might draw a nice "invisible outline" around the continent. I had trouble thinking that this was of an article on adoption since the kid looked dead to me (A little too dead) damn, how can I explain it, like there was really no hope, and I think there should be at least some. You should be illustrating books like Palestine or Safe Area Gorazde by Joe Sacco. You have the touch for controversial subjects. Man, that final kiss from the mother hurts like hell now. Her face says it all. I'm going upstairs to kiss my kids. sacco edited a book for fantagraphics waaaaaaaaaaaaaaaaay back in the day called 'centrifugal bumble puppy' and i used to do things for him. the stuff pops up on ebay all the time. i'll bet he's moved 12 times between today and the time i wrote out this rolodex card in a green prismacolor. At TIME we sent Joe Sacco to Hebron for a couple of weeks back in 2001. He did a lot of great stuff as I remember. We probably have his contact, I'll keep in mind to get in touch with him about coming here, you never know. Bob to Sacco: C'mon bumble puppy pal...for ol time sake? Edel to Sacco: This TIME, we're sending you to a place called Drawger. David, That is incredible! Very powerful and Africa was an instant read for me.